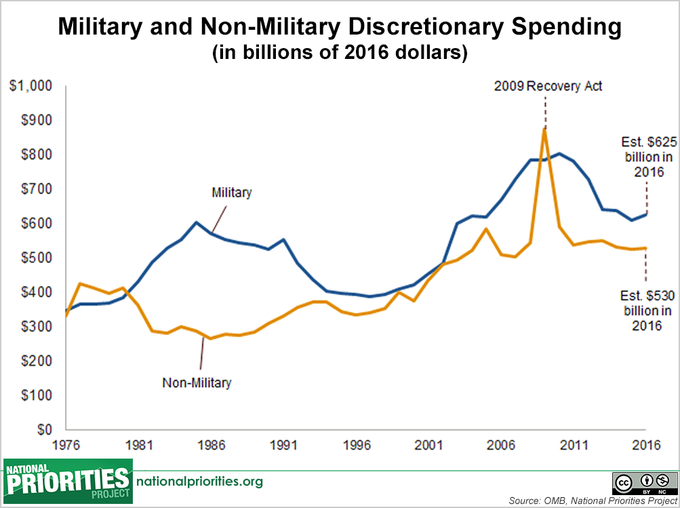 The president’s budget proposal would spend $612 billion on national defense discretionary programs, including funding for the Pentagon, war, nuclear weapons, and other related expenses, more than President Reagan ever spend in a single year. This represents a 4.5 percent increase over the 2015 enacted level and exceeds spending caps set by the Budget Control Act by $38 billion. The proposal includes $534 billion for the Department of Defense base budget, a figure that does not include war costs or nuclear weapons activities within the Department of Energy. That represents a more than $38 billion increase – a more than 7 percent increase – relative to 2015 enacted spending levels and would be the highest Department of Defense base budget in history. The budget funds the development of 19 more F-35 fighter jets than were produced in 2015, despite the fact that the planes are billions over budget and years behind schedule.